I've created a table where the rows alternate in colour however /hline is acting unusually. Does anybody know what I'm doing wrong? Thanks. This is a documented issue affecting the display of \hline lines in PDFs, and affects some PDF viewers (Adobe's Acrobat may not display the line while Apple's Preview might display it fine). In most cases, the problem should not affect the printed output you see on paper. See also: \cline doesn't work -- a different underlying problem, but a similar fix. Not the answer you're looking for? Browse other questions tagged xtable or ask your own question. 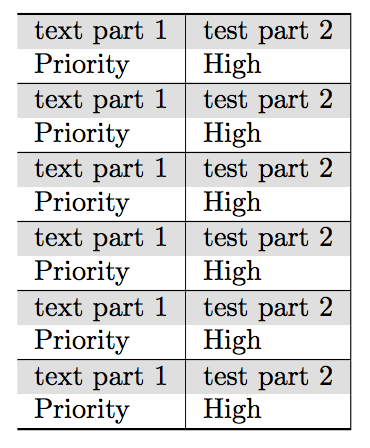 How to make multirow “footnote row” for dominating cell in LaTeX Table?